Already during my lifetime we’ve had one president (George W. Bush) who hailed from the immediate family of another (George H. W. Bush), and there’s a good chance we’ll be repeating the phenomenon with our next president. Four of them (9.3%) shared the last name of their familial predecessor: Adams, Harrison, Roosevelt, and Bush. If Hillary Clinton is elected to the 45th presidency², it will bump those two stats up to 13.6% and 11.4%, respectively. My question to the sociologically-minded statisticians of the world is: What numbers would we expect if we lived in a true meritocracy, rather than the oligarchy we evidently live in? 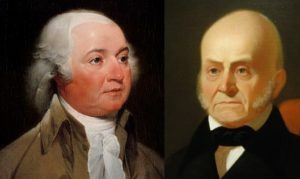 Put another way: Given what we know about the genetic makeup of the US population, how often would we expect a president to be at least second cousin to another president sheerly by chance? ¹ If we want to roll super deep with this, it appears that 42 out of our 43 presidents so far have all been related to the British King John Lackland who signed the Magna Carta in 1215. ² Thanks to Grover Cleveland serving two non-consecutive terms, we’ve so far had 44 presidencies but only 43 presidents. so…i think i can put an upper limit at around [a snowball’s chance in hell] that it would happen by random chance. assuming an average family size of 4 offspring (high for now, but maybe less high for 1790), and including the presidents’ and their [partner’s] families, i get 256 people with the level of relation of 2nd cousin (i.e., either the president or their partner shares at least as much DNA as a second cousin). Let’s assume all people live at the same time and there are 10^8 people eligible for the presidency. Then let’s calculate the total number of family members to choose from, since there could be overlap there. The probability that some family member of some president will be among the 256 family members of some other president is 256/10^8. So the probability that they won’t be is 1-256/10^8. We can calculate the probability that none of the family members will be the same person by multiplying together all the individual probabilities that they won’t be the same: (1-256/10^8)^(256*43)=0.972. So removing the family members we expect to be the same person, the total number to choose from is .972*43*256=10,700. Then the probability that a randomly chosen president will not be among those people is 1-10,700/10^8 and the probability that all 43 will not be is (1-10,700/10^8)^43=0.9954. So the probability that one of our presidents would have been so closely related is 0.0046 and the probability that it would have happened 5 times is…0.0046^5 = 2 x 10^-12.